The origin of the jigsaw puzzle is generally attributed to a European cartographer named John Spilsbury, who cut wooden maps of the British Empire into pieces in the 1760s so the aristocracy’s children could learn the geography of the lands Britain ruled. 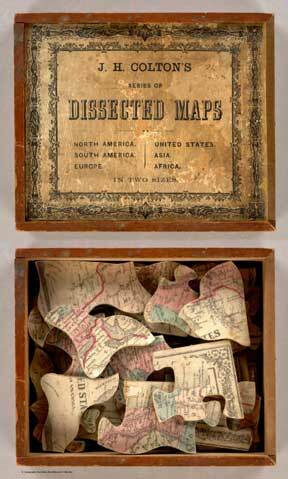 These early wooden puzzles, called “Dissected Maps,” began the history of the jigsaw puzzle, and their popularity among the upper class in Europe and the U.S. grew steadily throughout the 1800s. The first important development in the history of the jigsaw was that by 1900, the wooden jigsaw puzzle in the U.S. had evolved from children’s games into a form of entertainment for wealthy adults. The jigsaw puzzle found its way back across the Atlantic Ocean in the first decade of the 20th century, now as a popular form of entertainment for adults, and would often be found at parties or in the parlors of weekend estates. In 1908, Parker Brothers began producing their hand cut, wooden Pastime Puzzle line in Salem, MA, which quickly became one of the best remembered puzzle lines in the history of the jigsaw puzzle. 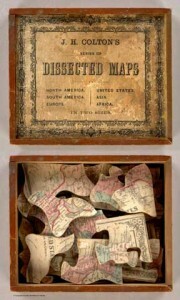 Soon after, Milton Bradley entered the market with their wooden Premier Jig Saw Puzzles. 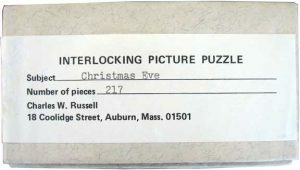 A host of others, such as Detroit Publishing Co.’s Travel Picture Puzzles, followed suit as the popularity of wooden jigsaw puzzles soared in the first three decades of the 20th century. The second important development in the history of the jigsaw puzzle was the evolution during the Great Depression of the mass-produced, die-cut, cardboard jigsaw puzzle. It was not until the Great Depression was underway that manufacturers of die-cut, cardboard jigsaw puzzles sprung up to meet the market demand for the entertainment of puzzles at prices families struggling through the Great Depression could afford. 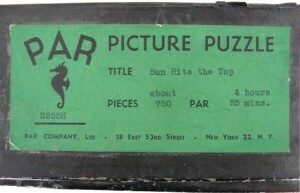 The most popular of these cardboard puzzles during the 1930s was the Perfect Picture Puzzle, manufactured by the Consolidated Paper Company in Somerville, MA. Known as “Weeklies” because a new puzzle was released each week, Perfect Picture Puzzles sold for ten to twenty-five cents each in 1933, bringing puzzle prices well within reach of the middle and lower classes, and thereby greatly expanding the puzzle market. Throughout the Great Depression in the U.S., as the bottom dropped out of the economy and unemployment and poverty levels reached staggering heights, the jigsaw puzzle took on a vital role as a positive source of family entertainment. Indeed, the jigsaw puzzle helped hold families together during the decade of strife–the wooden puzzle among the rich and the cardboard puzzle among the poor. The 1930s also saw a rise in the number of individuals entering the wooden jigsaw market–many with unique, handcrafted production methods. it is these craft pioneers that established the modern legacy wooden-jigsaw-puzzle cutters carry on today. One exceptional and unique production method came to life in the 1930s when a man named Charles Russell of Auburn, Massachusetts, fashioned a saw blade to his wife’s sewing machine and began cutting wooden jigsaw puzzles with it. I met him in his basement shop when I was three, and several times thereafter, as he was the puzzler whose interlocking puzzles my family collected most. 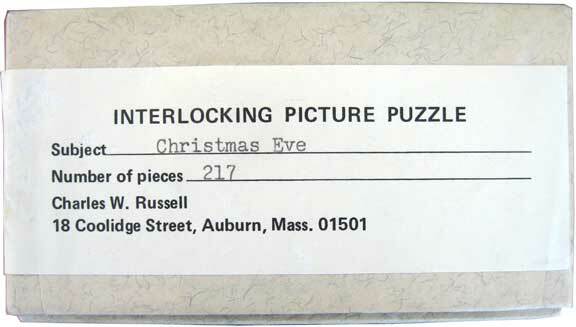 Many others collected Russell puzzles as well, including a distinguished business mogul named Mr. Bing who, upon hearing that failing eyesight was forcing Mr. Russell to stop cutting his puzzles, designed a special, bright lamp and flew it in his private plane from California to Mr. Russell’s basement shop. That lamp enabled Mr. Russell to cut puzzles for well over another decade. Among the other puzzles my family collected was the occasional Par Puzzle, whose creators were the most renowned hand cut, wooden puzzle makers of the twentieth century. In the entire history of the jigsaw puzzle, Par Puzzles set most of the high quality and cleverness standards to which modern day puzzlers adhere. Although the Par Puzzle era ended when the last of its two founders died in 1974, collectors still scour antique stores for used Par Puzzles, and pay hundreds or thousands of dollars for puzzles that may even have pieces missing! 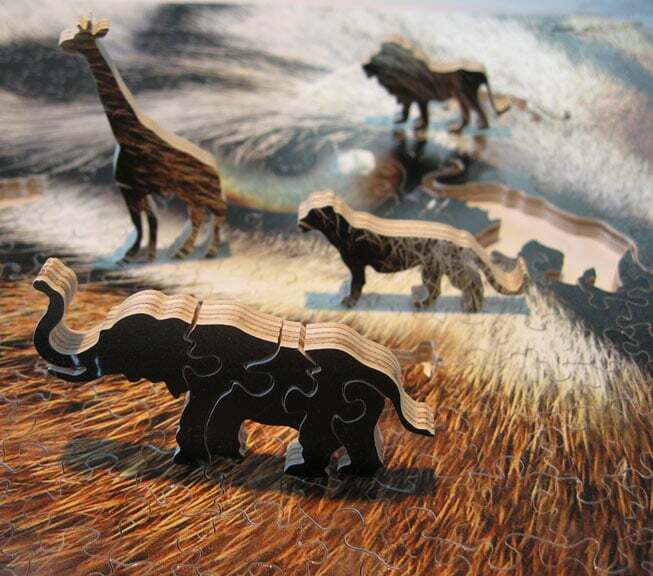 The wooden jigsaw puzzle today is still a high-end, niche market due in part to the high prices attributable to the great labor intensity of the production process. Most people have never even heard of the wooden jigsaw puzzle. The difference between the die-cut, cardboard, jigsaw puzzle and the uniquely-cut, hand-designed, wooden jigsaw puzzle is great; once you’ve done a handcrafted, wooden jigsaw puzzle, with its beautiful figural pieces, unique shapes, clever tricks, and charismatic, handmade, tactile sensations, the cardboard puzzle will forevermore be a trinket falling well short of replicating the art of the wooden jigsaw puzzle. Anne D. Williams, an economics professor at Bates College and jigsaw puzzle collector and historian, has written a thorough history of the jigsaw puzzle in her newest book, The Jigsaw Puzzle: Piecing Together a History. The high-end, jigsaw puzzle company WC Puzzles included in Anne’s book was founded and operated for over a decade by Zen Art & Design CEO, Will Carswell who was highlighted as one of only 23 puzzle cutters in the United States! WC Puzzles was renamed the Berkshire Puzzle Company and is what inspired Will to create ZAD and evolved into our jigsaw puzzle product lines – through teamwork, creativity, supporters, and a belief in quality.